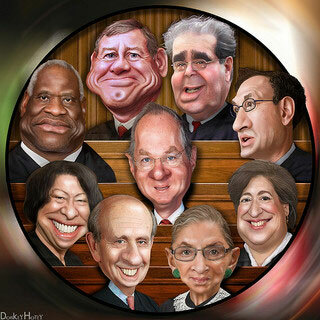 History reminder: Supreme Court not infallible. One year ago this month, my show producer Dave “Thirdwavedave” Logan posted this at his site. It’s a timely reminder of how the Supreme Court is not infallible. Among the things that pro-New Deal advocates hardly ever bring up is one of the most shameful acts by a president in U.S. history. That’s the infamous “court-packing” scheme that President Franklin Roosevelt proposed when the Supreme Court was declaring much of his New Deal unconstitutional. There were four justices leading the way toward declaring New Deal programs unconstitutional: Sutherland, Van Devanter, Butler, and McReynolds. They became known as the Four Horsemen. Sometimes, the decisions declaring a New Deal program were 5-4, with a justice named Owen Roberts joining the Four Horsemen. Roosevelt had an option that he could have pursued to circumvent the Supreme Court, one that the Constitution itself provided. To achieve the economic revolution that he sought, he could have pursued an amendment to the Constitution, one in which he formally asked the American people to reject the free-market way of life on which the U.S. had been founded and to accept a socialist and interventionist economic system. Instead, he deceitfully led the American people into believing that this new economic system would actually “save” freedom and free markets, despite the fact that its welfare-state and regulatory principles were directly contrary to those of a free-enterprise system, that is a system free of government control and interference. Even worse, once he realized that the Supreme Court was interfering with his plans by simply doing its job, he proposed his infamous plan in which he sought to pack the Supreme Court with his judicial cronies, so as to have the necessary votes to sustain the constitutionality of his programs. Here’s how FDR’s plan was going to work. For every justice over the age of 70, Roosevelt would be able to appoint an additional justice. He had calculated that given the ages of the sitting justices, his plan would give him the necessary votes he needed to get his program sustained. Roosevelt claimed that the reason he was proposing his plan was simply to relieve the workload of the Supreme Court. It was just more deceit, which was exposed when the Chief Justice of the United States showed that the Court was up-to-date with all its cases. To the everlasting credit of the American people, they raised a tremendous uproar and protest against the plan. By and large, Americans realized that Roosevelt was altering America’s economic system in fundamental ways. After all, they lived in a country in which people had lived for more than 125 years with the right to accumulate unlimited amounts of wealth and to do whatever they wanted with it—and in a country in which economic activity was, by and large, free of government control. But given the Great Depression, many Americans were willing to let Roosevelt get away with his new-fangled economic system. Not so, however, with the judicial system that the Framers had established with the Constitution. Americans refused to let FDR go that far, and their outcry against his court-packing scheme caused Congress to overwhelming defeat it. Roosevelt, however, ended up winning the war. Soon after his court-packing scheme went down to defeat, Justice Roberts voted with the other side in the watershed case of West Coast Hotel vs. Parrish in 1937. From day that forward, the Supreme Court would never again declare any of Roosevelt’s economic programs unconstitutional, especially once the Four Horsemen began retiring from the bench and being replaced with pro-New Deal justices. Unlike the legislative branch, which oftentimes responds to popular will, the role of the judicial branch is different. Its job is simply to place legislation against the Constitution and determine whether the two are consistent, regardless of whether the legislation is popular among the masses or not. If it isn’t constitutional, then it is the job of the Court to so declare it. With his court-packing scheme, Roosevelt tried to tamper with that system. While the scheme failed in the short run, Roosevelt got his way in the long run.